Did you get a chance to check out my first Before + After reveal from The Mod House Project last week?! Well, guess what! I’m right back at it, prepping for yet another project. We’ve all seen them before: Boring beige walls. Dingy tiles. Dated pedestal sink and faucet. 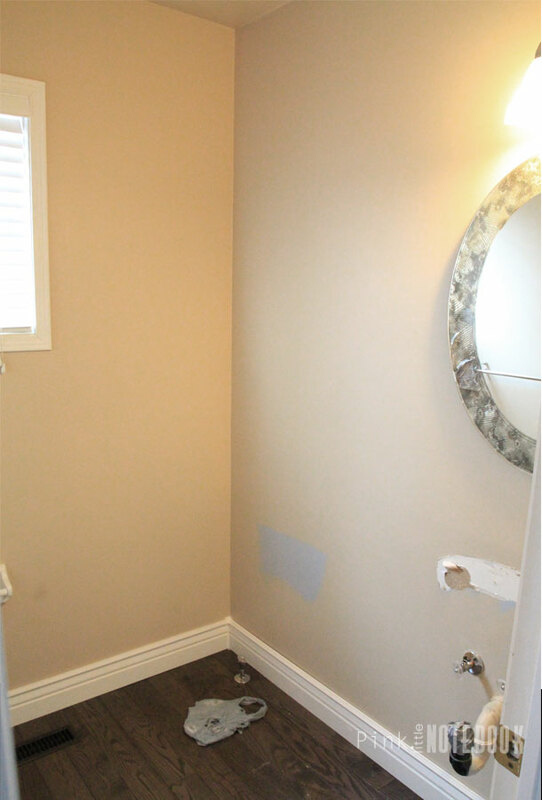 Just another typical space BUT with a dash of creativity and a little elbow grease, this powder room is about to undergo a major transformation. The above images were taken just before we started demolition at our home. If you recall, we got rid of that tile floor right from the start (which means half the work is already completed). This tiny space gets flooded with tons of natural day light. With a small window on the back wall and a comfortable distance between the toilet and sink, it’s an ideal space for a powder room. From day one, I had a vision for this powder room. A moody vision! Keeping in theme with the rest of the house, I want to add drama. And whole lot of it! Think dark colours and architectural details! 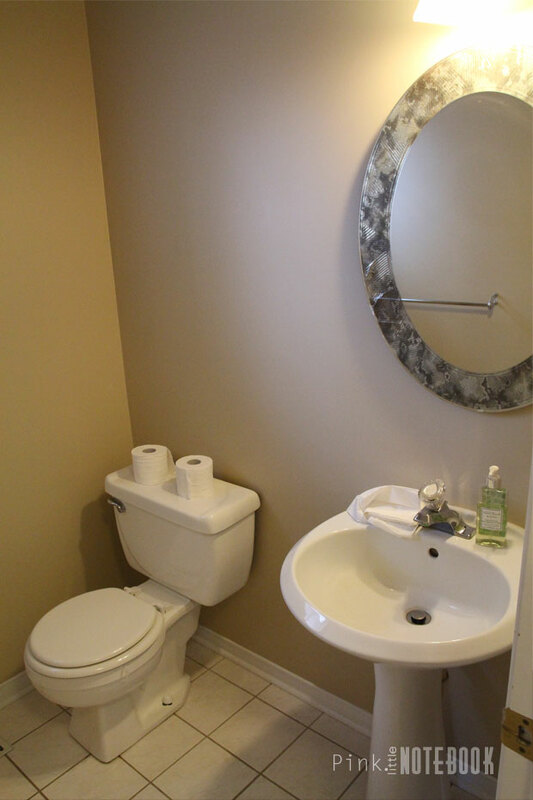 To begin, we removed everything out of the powder room including any fixtures on the wall (except the toilet paper holder, we are keeping that). 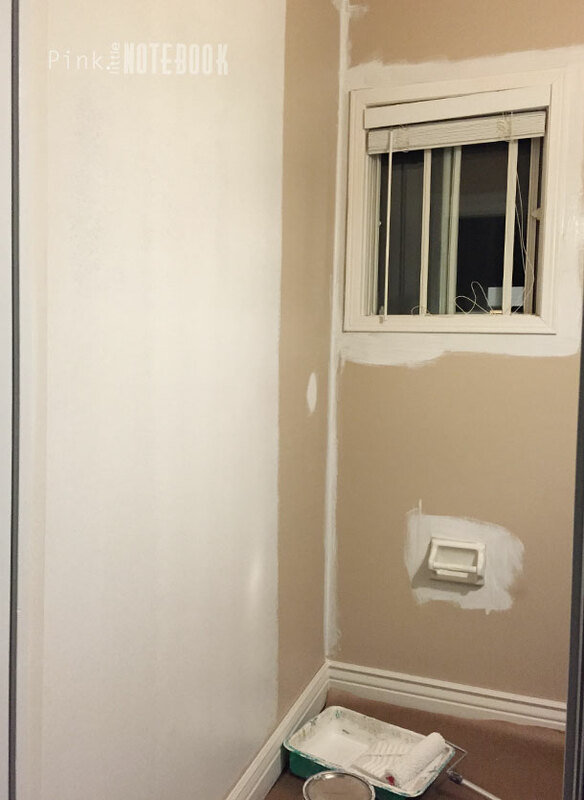 We prepped the walls by patching all the holes and priming with paint. 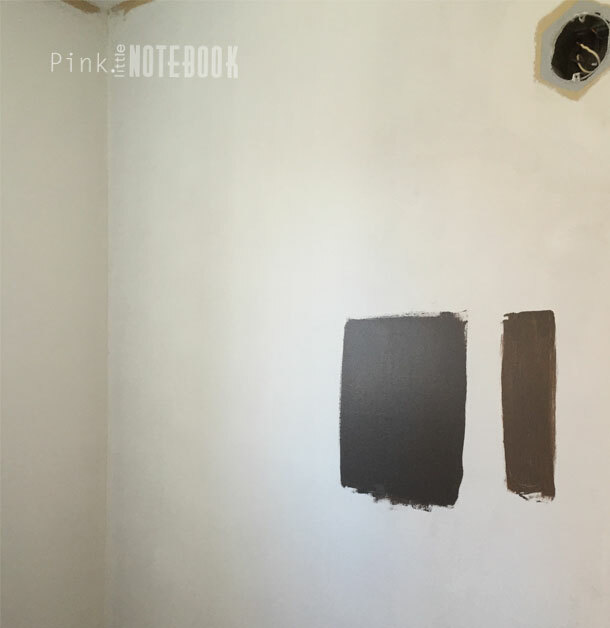 Next, I decided on a dark colour (the one on the left) called Brush Nickel (P5244-62, PARA Paints). It’s a warm hue that incorporates just the right amounts of charcoal grey and brown. I originally planned to paint everything including trim for a monochromatic look. However, last minute I sort of decided I may want to keep the baseboards white. Hence, why you see a messy paint job. I’m still unsure which direction to go. What do you think? Should I paint the baseboards Brush Nickel or White? I’m also looking to add detail to our ceiling. I’m thinking of using either a paintable textured wallpaper or MDF to create a panel effect. Can you picture my vision yet? I hope so because this 23 sq. ft. room is about to pack a big punch! See full powder room reveal here! I think bright white baseboards will look beautiful against the dark color. I would keep the trim white. I really like the dark shade you chose. Hi Khadija! I’m thinking it would be nice as well to have that division between the walls and floors. Thanks so much for your feedback. I really appreciate it!! 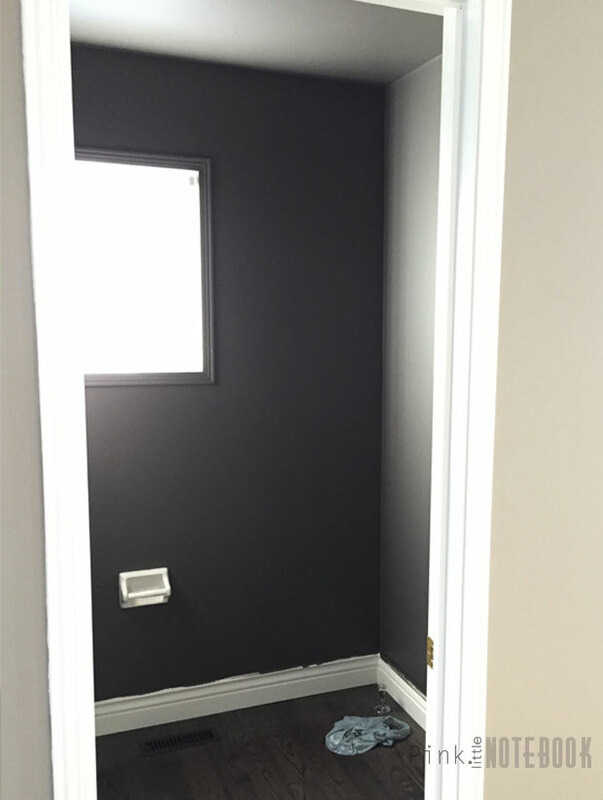 In my bedroom, I painted all the trim the same dark color, in large part because the ceilings are so low and I thought the white trim would make it look even lower. I love how it turned out, but I think the white contrast would look good in your space too. You can’t go wrong, but I think my vote is for the monochromatic look! Hey Sabrina! Love the colour choices. Are you painting the ceiling as well? Hi Susan! The ceiling is painted Brush Nickel as well, however, it’s hard to tell in the above images. Not only does the size of this powder room make it difficult to photograph but I’m also pointing a camera directly at a window which is creating awful glares 🙁 Must figure out a better way to take pictures! 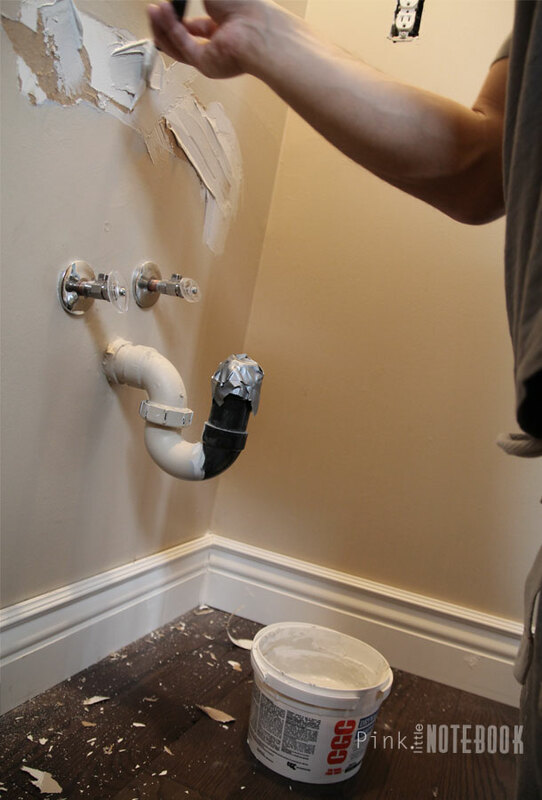 I like the white baseboards against the dark wall color. 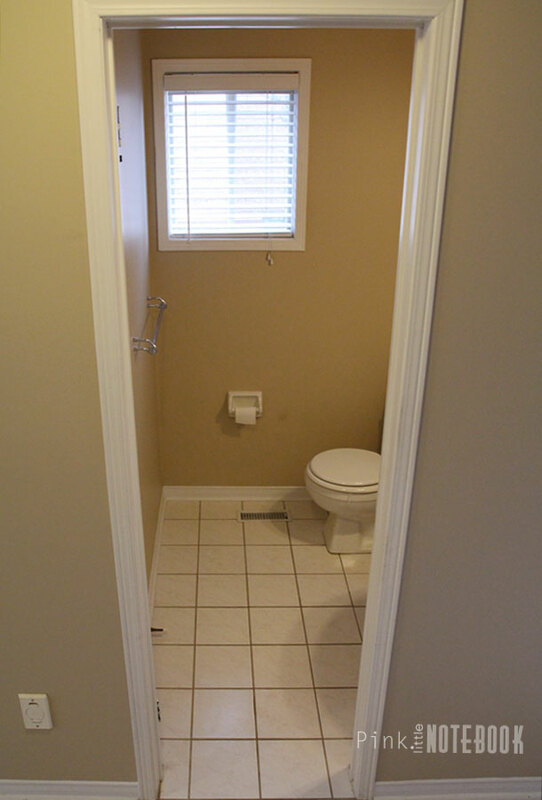 I love the color you chose for the bathroom. I can definitely picture your vision! Can’t wait to see the finished product. Love this! You can change a rooms entire ambiance with just a coat of paint! Beautiful color! I think the brush nickel would be unique. You’ve got me wanting to re-vamp our bathroom. I really love the white base board idea which helps to make the toilet roll dispenser appear connected to the wall. I am feeling if you go monochromatic the opposite will happen. both toilet roll dispenser and the toilet bowl will feel like they are floating.